In 1859, Sir Richard Owen (not the first time we heard of him and it won’t be the last) described some vertebrae from Australia. They appeared to come from a lizard, but far larger than any lizard known. 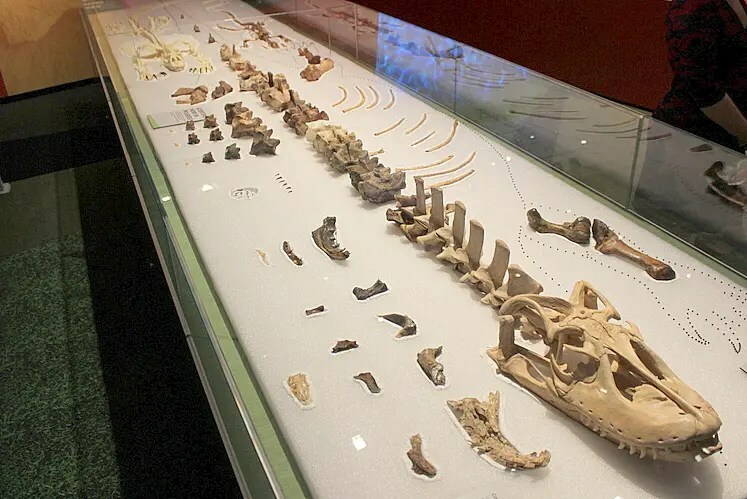 He named the animal Megalania prisca, which translates to “ancient giant ripper”. A name like that conjures images of a titanic and savage predator. But again, Owen just described some vertebrae. Not a whole lot to go on when trying to uncover the nature of an extinct species. Since Owen’s initial paper, more fossils have been found, including a partial skeleton. However, they are fragmentary and sparse. Even the partial skeleton is far from complete. This hasn’t stopped diligent scientists from trying to piece together this animal’s paleobiology. For much of the time it was known it was designated its own genus, Megalania. More recently, though, it was placed the genus Varanus, the genus that includes all monitor lizards including komodo dragons. 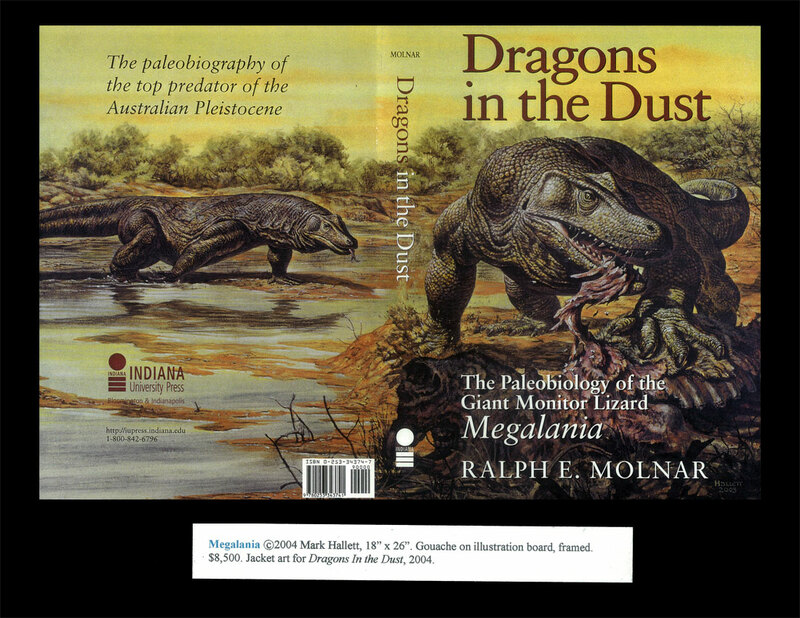 In his book “Dragons in the Dust” Ralph Molnar posited that if Megalania was ever sunk into Varanus, Megalania would likely remain as it’s common name. I will continue as such. 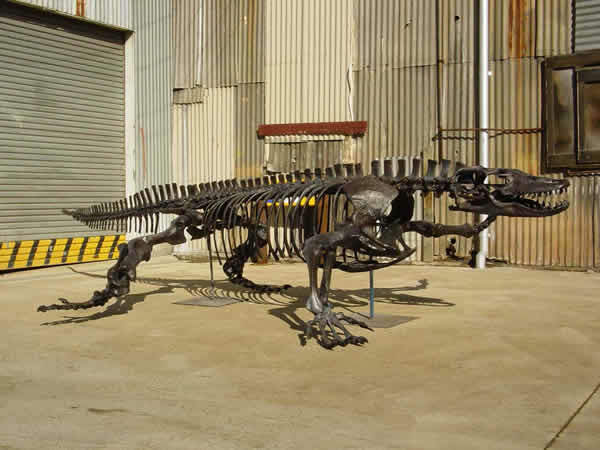 Reconstructed skeleton of Megalania by Gondwana Studios. The most noteworthy aspect of Megalania is its size, though that is a matter of debate. In the 1970s Max Hecht calculated that Megalania could have been as much as 27 feet long and weighed more than 1300 pounds. These estimates were challenged by Wroe, whose own calculations gave a maximum size of 15 feet and 750 pounds, with a length of 11 feet and 250-300 pounds being the average. Next up was a recent study of a large lizard on an island in the Mediterranean which also attempted to tackle the size issue. They came up with a length of 11 feet, about what Wroe came up with. However, Ralph Molnar came up with a range of sizes and calculated that while the lengths Hecht came up with could be possible maximums, the likely average was probably more like 18 feet long and 500 pounds. So who is right? That may be difficult to determine. For starters, these averages are only estimates. I never did believe that Wroe was able to just calculate an average size, since I thought calculating averages involved measuring numerous specimens and finding the mean between them. Given the dearth of Megalania fossils found so far, I’m not sure such an average could be deduced. Furthermore, the recent study used a limited dataset for their measurements, mostly using casts from the American Museum’s collection. Finally, we have two large estimates and two small estimates. Whose is right? Which one do we go by? I remember reading in a National Geographic article about the marsupial lion that we finally got a handle on its size. I believe Wroe’s words were “The fact that we used two different methods to arrive at the same estimate means we’ve nailed the size of this animal.” Ok fair enough. They fact that all these various methods have produced nothing consistent should mean that this lizard’s true size has yet to be determined. But one thing should be obvious: it was big. Bigger than any lizard alive today. Even large lizards like komodo dragons and parenties are pint-sized compared to fossils of Megalania. It was like my friend Eric Scott said back in my post about Arctodus. He said he would show me an Arctodus bone next to that of a modern to show plainly that it was very large (He has yet to do that. But then again, I keep forgetting to take him up on it). When compared with modern lizards, it’s hard to imagine Megalania as anything but a giant. Bones and partial skeletal layout of Megalania. It’s a little hard to see, but in the upper left is a skeleton of a komodo dragon. But even here we can tell that Megalania was a much larger animal. So just what place did Megalania have in its ecosystem? It has long been interpetid that Megalania was an alpha predator. Like its close cousin the komodo dragon, it had serrated, recurved teeth (not unlike a dinosaurs), strong jaws, and sharp claws. It is often thought, also like the komodo dragon, that Megalania was venomous. Modern komodo dragons use venom to take down large prey like deer, pigs, goats, and even water buffalo. Not much of the skull is known, though i I don’t know if the dragon’s venom glands leave any clues in the jaw structure. But if it was venomous, combined with its size and weaponry, there may not have been anything Megalania couldn’t take down. The marsupial tapir, the megaroo, Zygomaturus, wallabies… Some have even suggested it may have preyed on the largest of marsupials Diprotodon. Modern varanids are actually good sprinters, and persue prey longer than most reptiles. This is due to a unique method of breathing, wherein the animal “gulps” in air, increasing the amount entering its lungs. Megalania may very have had this trait too, but like the kmodo dragon was primarily an ambush predator. Right now it’s looking like Megalania was short on competition in it’s strange world. That might have changed when a new creature, also being used to the top of the food chain, entered the scene. Meglania feeding on the carcass of the giant marsupial Diprotod by Mark Hallet. I need to get a poster of that (sans the text, of course). Megalania is thought to have died out between 45,000 and 50,000 years ago. About the same time humans are thought to have made their way to Australia. Humans have never seen a dinosaur. They have never seen anything quite like a dinosaur. That is, until they ran into Australia’s top predator. I can only imagine terrifying that must have been for them. A feathered dinosaur would have looked like a giant bird (maybe Hearthstone’s Angry Chicken could use some new art work). Megalania, with its scaly hide, flicking tongue, and hissing breath, with venomous spit dripping from jaws lined with knife-like teeth, Megalania must have looked like the lizard from hell. Sure, humans would have been no stranger to large crocodiles throughout their evolution and migrations. But crocodiles are restricted to water. This was an animal who could stalk on dry land, going pretty much anywhere it pleased. It could possibly have been able to run down a human. How could the early aborigines have defended themselves from this monster? We don’t know what kind of weaponry they had. The woomera doesn’t appear in Australia until 5,000 years ago (as far as i know). Scientists think they would have been armed with spears that were little more than long sticks ending in a fare hardened tip. A nasty weapon no doubt, but would it have been able to repel Megalania? Hard to say. 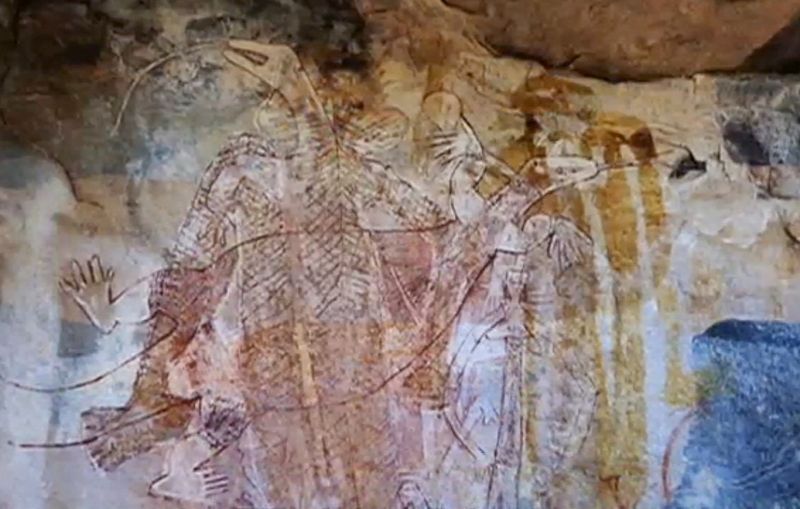 A man by the name of Peter Hancock thinks that ancestral memories of Megalania may have survived in the oral traditions of the Aborigines. For example: “A New South Wales clan tells of Mungoon-gali, the giant goanna, which ambushed people near waterholes. Central Desert tradition has it that Koockard the goanna killed two boys who had teased him, and in the Balgo region of Western Australia’s north they have a story about a goanna that fought a crocodile – and won.” In his book, “The Crocodile that Wasn’t”, Hancock describes a tale from the Nyungar people of southwest Australia that he thinks is about Megalania. In the story, a giant lizard terrorizes a village. The people pray for a solution and 7 dingoes arrive and attack the creature. One bites off its tail and the lizard flees the land. But could this have been Megalania? Megalania is thought to have died out no later than 45,000 years ago. Dingoes are believed to have come to Australia 3,500 years ago. Whether the story is true or not, I’m sure most people today are glad it’s extinct. 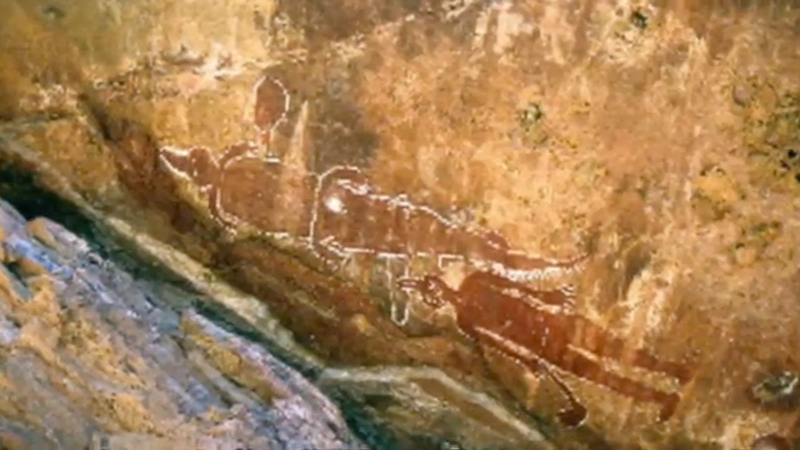 Aboriginal rock art of a lizard that appears to be larger than a man. We fear monsters. But we also fear animals that we make out to be monsters. Like the new Godzilla, they are not good or evil. They are simply animals doing what they have to to survive. Godzilla does have a certain inate malice which the military thinks it’s trying to repel. Some military personnel even state what we would do if Godzilla were to rise from the depths and start wreaking havoc. But Godzilla is a myth created purely of our imagination. 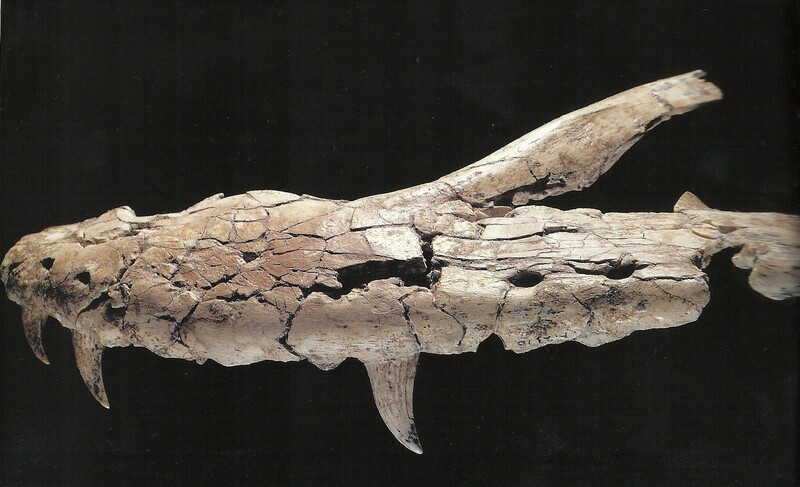 Megalania was a flesh and blood creature. Our ice age compatriots may very well have had to deal with it when they made landfall in what must have been an alien world. Dinosaurs can only chase humans on the silver screen. But the giant lizard who stalked Pleistocene Australia was the closest thing, a reptile seemingly out of time. You can keep your fuzzy tyrants and fluffy raptors. I know what animal would truly haunt our nightmares. In fact, it may be already. This entry was posted in Critters Abroad and tagged aborigine, Australia, fossils, giant, goanna, Godzilla, ice age, Megalania, monitor lizard, paleontology, Pleistocene, size, Varanus priscus by accpaleo. Bookmark the permalink.